Dubai, UAE, January 05, 2019: Parmigiani Fleurier has expanded its Tonda Métropolitaine Sélène range following the resounding success of this watch, launched in 2016, with two new models in rose gold. These models display the moon phases thanks to a movement produced entirely in-house and set in a modern, refined rose gold case. 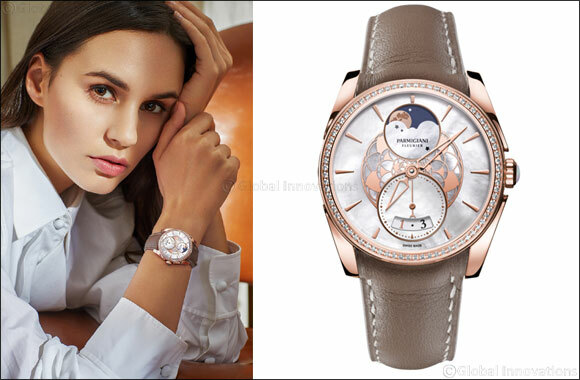 The Tonda Métropolitaine Sélène in rose gold features two dial versions: the first, in abyss blue, is adorned with a central lotus flower – a symbol of femininity. This decoration is cut from mother of pearl and applied to the dial, from which it stands out 0.2 mm. The satin and polished finishes of the lace design create a play of light that beautifully showcases the quality of the workmanship. The second dial is made from highly reflective white mother of pearl, and features a lotus flower in solid rose gold, echoing the indices and the case. On each dial version, the bezel is adorned with 76 brilliant-cut diamonds totalling ~0.52 carat. The PF318 movement and its moon phase module is the 33rd movement created within the Parmigiani Fleurier manufactures. The moon phase's operating principle is based on a gear moved by the hour wheel, which rotates at half the speed of the gear. The gear drives the moon disc every 24 hours via a flexible blade integrated in the centre of its wheel. A corrector at 9 o'clock enables the wearer to independently index the moon in relation to the day and date in order to match its phase to the geographic reference location. The PF318 self-winding movement has a power reserve of 50 hours and excellent isochronism thanks to its two series-mounted barrels that regulate the rate. Visible through the watch's sapphire case back, this calibre is entirely circular-grained, decorated with Côtes de Genève and bevelled to the finest haute horlogerie standards customarily applied in the Parmigiani Fleurier manufacture.